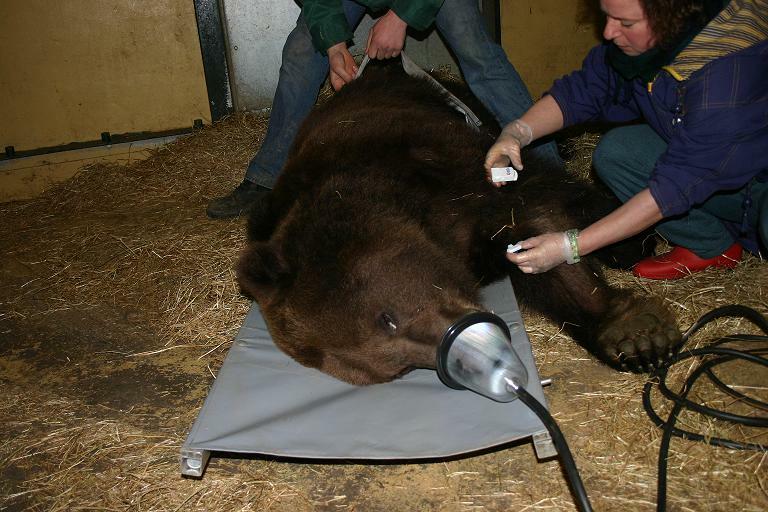 This part of the website, Veterinary Management of the brown bear (Ursus arctos), is the third part of a series about the management of LBEs and its inhabitants. The veterinary principles and related information which are discussed and presented here are based on experiences in the Bear Forest in Ouwehand Zoo and is primarily meant for managers and veterinarians. These chapters deal with the practical approach of managing captive brown bears in their most natural setting. Amongst others, this requires knowledge of health threats that can occur under semi-wild conditions. The veterinarian should be able to diagnose health problems by means of simple and practical strategies. An overall view of present-day veterinary management is given, often accompanied by photos or simple graphics. Checklists are added, which can be used for examination of a (live) bear and post-mortem examination. Bears in Mind kindly requests to share this information to optimize and further develop the information presented on this website. Please send the completed forms to the Bears in Mind office (for address details see Contact). This part of the website is a joint cooperative between Ouwehand Zoo and Bears in Mind.